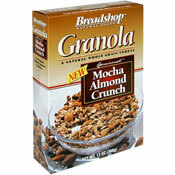 The complete name of this cereal is Breadshop Natural Foods Granola - Gourmet Mocha Almond Crunch. It's described on the box as "a natural whole grain cereal." A picture on the front of the box shows chunks of chocolate, whole almonds and clusters of granola. What do you think of Granola: Mocha Almond Crunch? 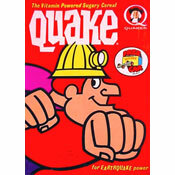 The best cereal I have ever eaten! Unable to find it anywhere now!